Last night I managed to finish one of two little quilts I have been wanting to make for a while now. These quilts are special not just because of their lack of colour, but because of the thinking behind them. 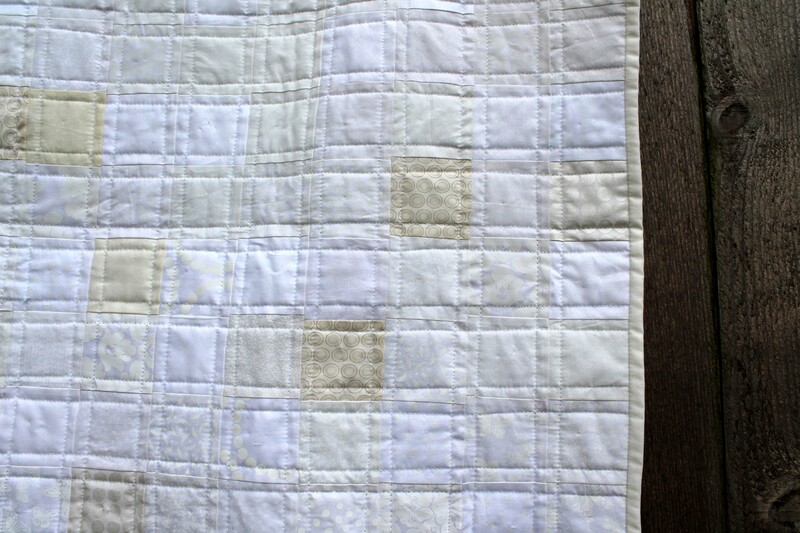 This simple little quilt is made up of a variety of 3 inch squares of white and cream tone on tone fabrics. I was inspired to make this quilt after seeing the fabulous Molli Sparkle’s “No Value quilt“. It was a challenge to work with just white but it was great fun. I ended up using off white and cream to get some variation in the quilt, so the eye had something to follow. 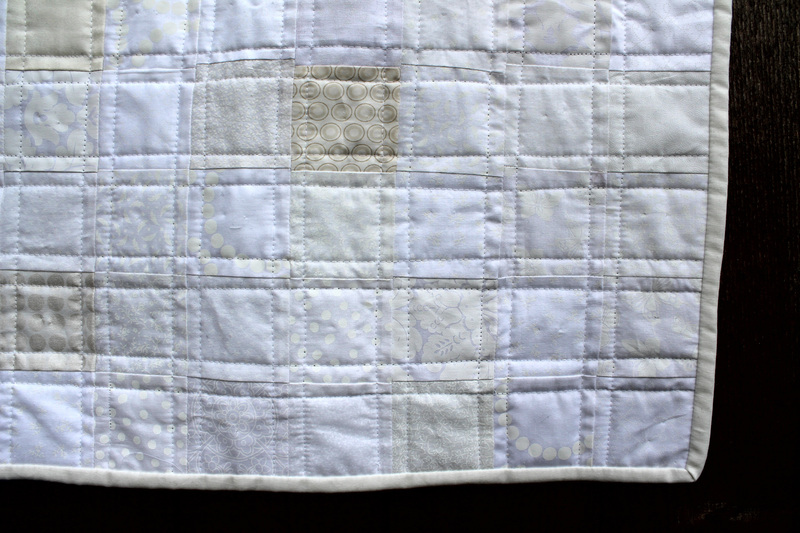 So why tiny little white quilts… Christmas last year some friends of our suffered the heartache of having their son be still born. It is a heart ache I can not imagine, but one that a few people I know have suffered. There was nothing I could do at the time but cry, support and pray. Recently I was talking to some members in our Project Linus group who told me about the little white blankets that a group had been knitting and crocheting for some local hospitals. These tiny blankets are used to wrap a child in when it is presented to its parents to say goodbye. The parents can then take the blanket home as a remembrance of their child. I do not knit but I thought that a tiny quilt would be just as useful. So I set about making two little quilts in remembrance of my friends and their son. As with all my quilts there is a splash of Mirror Ball and a splash of Pearl Bracelet fabric… and a huge dash of love. 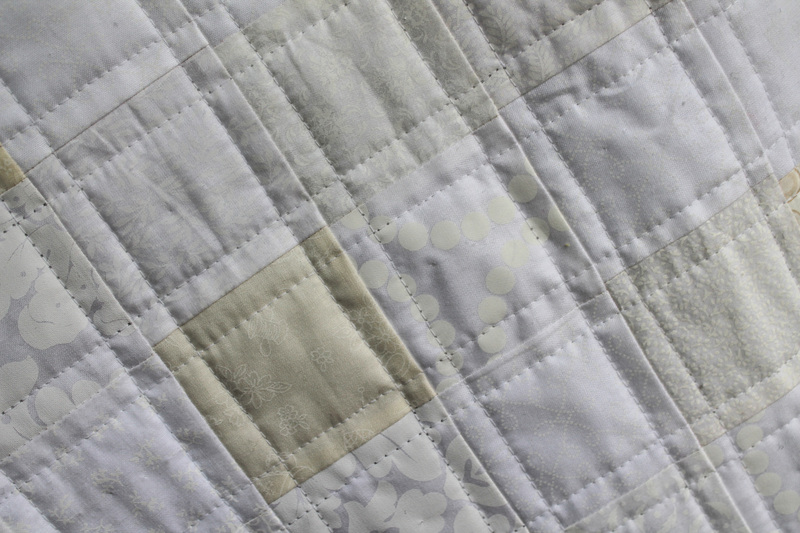 I backed this quilt with a scrap of white fabric I had and a splash Mirror Ball and bound the quilt with Michael Miller’s Couture Cotton in Cream. I have one more of these quilts to bind and then they are off to do their job of bringing comfort and support. There are a number of wonderful charities that delivery blankets/quilts to hospitals for this need, including Forever Warm in the USA, Sands in Australia, Sands in the UK and of course your local Project Linus chapter or Neonatal hospital. On a much happier note, our friends who suffered such heartbreak last year have just had a beautiful, healthy baby girl. Life really is a wonderful roller coaster of a ride. Beautiful work, beautiful idea. You give away so much of your work. I would love to see which quilts you decided to keep for yourself…? Gorgeous to the Nth degree! Fabulous background to the quilt story as well! They are like their own peace doves in more ways than one. I can not thank you enough for the inspiration. 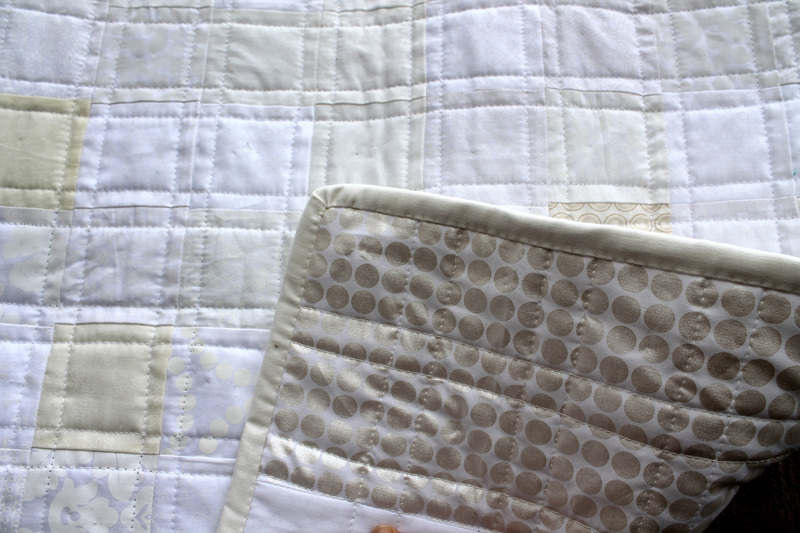 Your stunning white quilt was just the perfect push I needed to make these. Amazing to think what a big impact our little actions can make on the hardest day of someone’s life. Wow. This is the first time that I have heard of white quilts. That is such a wonderful thing to do for grieving parents. Wonderful reason to make these beautiful little quilts. Our nephew lost a child, and it is something even the extended family members never forget. And, it is so nice that your friends were blessed with a daughter. May their family experience joy, peace, love, and good health this year. This is such a lovely thing to make. In those moments if such intense grief there is nothing we can do, nothing we can say. But a little piece of peace. No words to make it jar. Just a loving cuddle. I can think of nothing that would help more. What beautiful quilts and such a nice thought to help those who need something to comfort them. I think I like the reason you made it even more than the quilt itself. Both are beautiful though! Thank you for sharing this. I have been there and now I will make these quilts in memory of my son. Cath. Thank you for sharing these beautiful quilts and the story behind them. Beautiful work as always – love your heart. What a wonderful thing to have made. I wouldn’t have thought of this – thanks for raising awareness. what a beautiful idea and a beautiful quilt. Oh, bless you for this! What a lovely thing to do, and beautifully executed. My tears are rolling- I’m visiting from Crazy Mom Quilts’ finish it up Friday. I am 9 months pregnant with my daughter… who is really my second child. My first child is my son, who was stillborn exactly 11 months ago today. 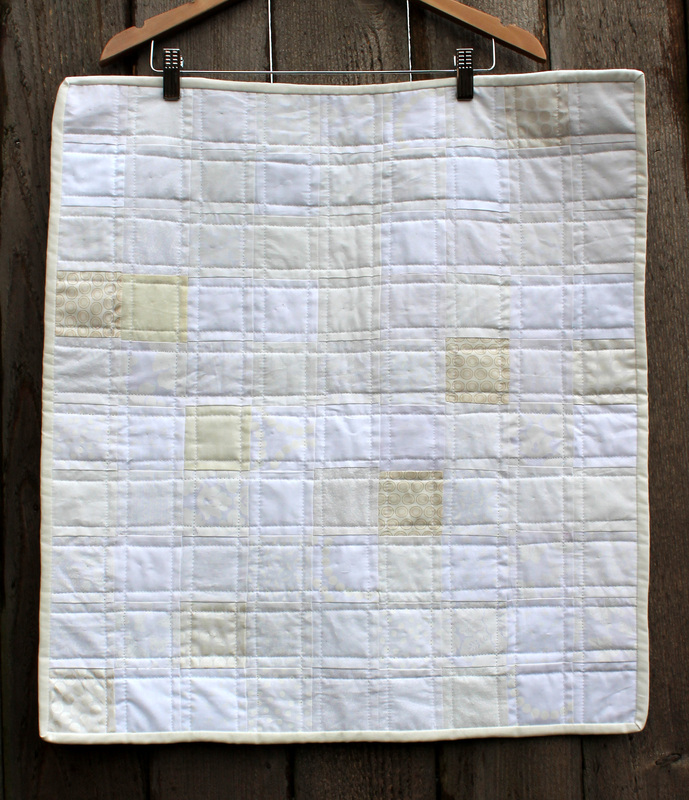 When we found out (during my pregnancy) that our son was very sick, I hurried to finish his baby quilt so I would be sure to have something for him in the hospital in case he came early. It is truly one of my greatest comforts to have the quilt he was wrapped in when we met him. I can’t tell you how very much it means to think of people giving such a lovely gift to other parents like me. I’ve bookmarked the site and someday, I hope I’ll be able to make and donate quilts too. In the meantime- your quilts are lovely, and the gift of giving them even lovelier. This is an awesome project that you are participating in. Thank you for sharing. I hope to get involved at some point. This is so inspiring! Very touching story and a beautiful quilt, Cath. Thanks for sharing the happy ending, too! Your quilts are beautiful. IF someone would like to help these parents and does not participate in Project Linus, there is also a SHARE group affiliated with most hospitals. They do the same kinds of things. Thanks Nadine. I did not know about Share, are they US based? Your quilt has touched my heart. I lost a daughter 42 years ago. How I would have appreciated such a quilt. You have inspired me to make quilts for others who experience this loss. Bless you. Your love and compassion inspire me. What a special gift. You are truly a blessing to your friends and to grieving parents who need you, but you have never met. Just beautiful! I would like to reblog but not sure how that works. Feel free to re blog…I am a huge Project Linus Supporter and regularly post about our wonderful Portland Chapter. If this is a technical question about how to do it… You can link to my page, press the re-blog button or paste my link into Facebook. Reblogged this on Blankets for Linus. This is a wonderful thing to do for parents, and the quilts have been on my mind, I need to make a couple. However; I’m not long home from work at S’bux, and I’m taking deep breaths and wondering what I’ve done: A customer told me her husband had been killed on Dec 11th, in a horrendous accident which she witnessed. When I was driving home I began to think of your little quilt and wondered if I could ask her for some of his shirts, and make her a lap quilt to comfort her? Then I began to second guess myself – I don’t know her very well, but she is suffering so much. She came into the store today and I took courage and asked her if she could bring me some of his shirts that she could bear to part with, and that I could cut up, but didn’t tell her what I wanted to do except that I wanted to make her something. She said yes, she would. Now I’m going thru a ‘fear of failure’ moment, and did I do the right thing by asking? Perhaps I’ll make her a lap quilt she won’t like, and she will regret giving me the precious shirts? Oh boy, more deep breaths….keep a good thought for me, my heart will be in this project, and I hope it will bring her some comfort…. Linda this is a wonderful thing you have done. I have learnt over the years that the kids/families/people respond to the thoughtfulness behind the quilt much more than they do to the pattern or the fabric. No matter what you make her she will treasure it, because it has a piece of her husband in it and because it is being made with such love. Thank you so much for responding to my ‘plight’ 🙂 There have been occasions in the past when I’ve denied the need to do something for someone for various reasons, then regretted it. I didn’t want this to be another of those occasions. Deep breaths onward and upward! Pingback: Low Volume Fabrics and Quilts | Quilting! Sewing! Creating! 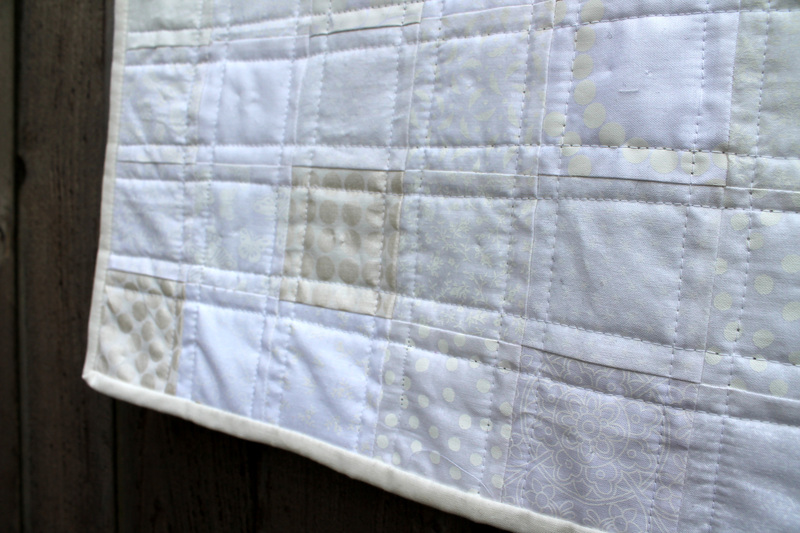 Pingback: DIY Low Volume Baby Quilt | Quilting! Sewing! Creating! I am so glad I found this post. I found it so inspirational. I made one myself and finished it yesterday on what would have been my son’s 30th bday. I am donating it to the hospital where my granddaughter was still born in 2011. (Her sister arrived healthy and happy a year later.) Thanks again, I’ve linked to this post twice in my blog and once on my fb page. Great inspiration! Kathy, I am so glad you have made your own quilt in memory of your son. I know that quilting has given me such solace over the last year, I hope it has done the same for you.